Beautiful royal blue 1951 Crosley Bullseye in a completely restored condition. These Crosley sets are icons of the 1950's Retro look. The case had several paint chips, so it's been completely repainted by a body shop professional in an original royal blue color, and the radio looks like the day it came off the store shelf. No repairs to the case, no cracks or other cosmetic damage. Matching knobs, and the back is in place. The radio has been gone over by a professional and everything needing replacing was done, and the radio is playing well, picking up all my local AM stations clearly. 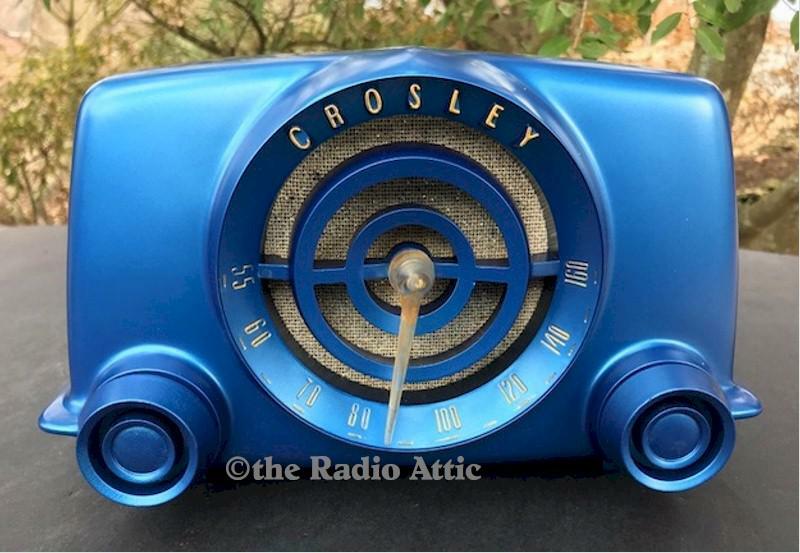 A very cute Crosley Bullseye in excellent condition and in a killer royal blue color. About 9-1/2"W x 6"H x 6-1/2"D.
You are visitor number 871 to this page.